(Phys.org) —A team of researchers at Technion-Israel Institute of Technology has developed a new class of metamaterials that allow for control of the spread of light in communications devices. 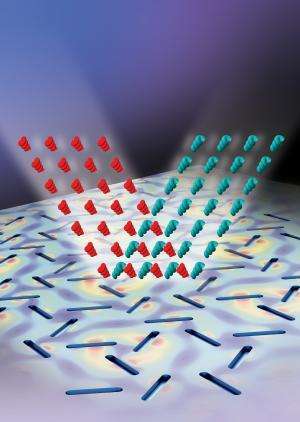 As the team explains in their paper published in the journal Science, the new materials are able to alter the standard characteristics of light waves. Current electronic components used in communications technology are considered by most in the field to be bulky compared to other types of equipment. Also, engineers find it difficult to integrate such devices with typical microelectronic circuitry. For that reason, scientists have been looking for ways to change the way such devices are designed and built. In this new effort, the team from Israel has created a class of metamaterials that control the way light spreads, paving the way for entirely new types of communications devices. The new metamaterials developed by the team are based on spin optics where photon helicity degeneracy is prevented due to the geometric gradient that exists on their surface. They are also anisotropic—they don't behave the same way when measured from different directions. Also, unlike current technology, they are polarization-dependent. Together these features cause light waves to propagate in ways not typically seen in current communications equipment. In addition, because of their polarization dependence, design engineers can create new devices that allow for a novel way to control communication devices—by the selection of the polarization of light at the outset. The researchers also report the new materials don't show inversion symmetry on their surface. 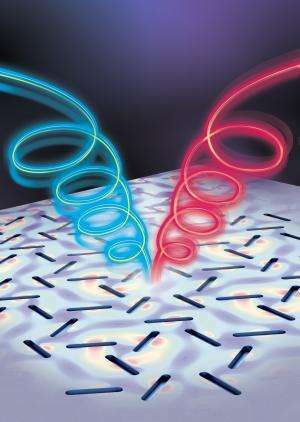 Because of their unique properties, the new metamaterials are expected to help engineers design and develop communications devices that are more streamlined due to an ability to control the spread of electromagnetic waves—they set the stage for devices that are able to manipulate light at the nanoscale. Such devices are also expected to result in simpler interface connections with other electronic components. The end result would be smaller devices that are easier to use and that work well with other electronic equipment. The new materials were inspired by metallic nanoantennae found in nature, the team reports. Spin optics provides a route to control light, whereby the photon helicity (spin angular momentum) degeneracy is removed due to a geometric gradient onto a metasurface. The alliance of spin optics and metamaterials offers the dispersion engineering of a structured matter in a polarization helicity–dependent manner. We show that polarization-controlled optical modes of metamaterials arise where the spatial inversion symmetry is violated. The emerged spin-split dispersion of spontaneous emission originates from the spin-orbit interaction of light, generating a selection rule based on symmetry restrictions in a spin-optical metamaterial. The inversion asymmetric metasurface is obtained via anisotropic optical antenna patterns. This type of metamaterial provides a route for spin-controlled nanophotonic applications based on the design of the metasurface symmetry properties.